You love visiting Tomorrowland at Magic Kingdom, now experience it in a whole new way in Disney’s Tomorrowland! If you have yet to see the movie, definitely watch it in IMAX. This refreshingly (mostly) original movie is a pleasant change of pace from the countless reboots and remakes out there. As a researcher into the convergence of cinema and theme parks (my thesis will be published soon), this movie is of particular interest to me because of how it translates the theme park land into a narrative film. Often we see the opposite: a theme park experience being inspired by or based on a movie. This movie is well paced, developed, and produced. Ordinarily, I receive much flack for how hard I can be on Disney. That’s because when you profess to be the best, you need to consistently deliver a quality product, and acknowledge the criticism both positive and negative. However, this is one Disney review that I am particularly excited to write because I truly enjoyed the movie immensely, and could see a glimpse of the classic Disney style that the brand and studio still bank on (but not necessarily still deliver) today. Tomorrowland takes you from present day Cape Canaveral, Florida to a land that is bustling with dreams, ingenuity, and talent. Follow young Frank Walker (Thomas Robinson) as his trip to the 1964 New York City World’s Fair becomes much more than he could have ever anticipated. 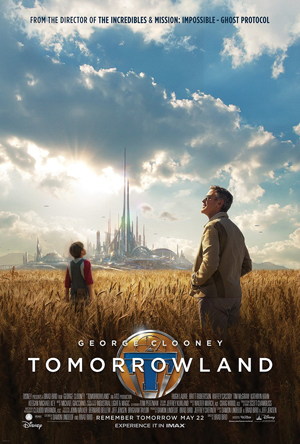 It’s there he meets a young lady named Athena (Raffey Cassidy) who shows him the futuristic city of Tomorrowland. Speeding up to present day, meet Casey Newton (Britt Robertson) who is doing everything in her power to thwart the demolition of the Kennedy Space Center NASA launch platform in order to save her dreams and her dad’s job. Through a series of unfortunate events, Casey comes into possession of a pin that shows her the world of Tomorrowland. Inspired by the glimpse of the city, Casey is determined to find out more about the mysterious pin. Only, Casey could never have dreamed about what this chance finding of the pin would mean; and furthermore, she could never have imagined the adventure she is about to find herself on to save the future of her world and Tomorrowland. From the time the theme song “There’s a Great Big Beautiful Tomorrow” from Disney Carousel of Progress, located in present day Tomorrowland at Magic Kingdom, begins to play, you know right then and there that this movie will capture your imagination. For fans of and frequent visitors to either the park in Florida or the original in California, you will find many Easter Eggs (film jargon for references to other movies, books, theme park attractions, etc) from the Disney parks. Experience It’s a Small World right there in the movie theatre; and during the sweeping shots and panoramic views of Tomorrowland, see Space Mountain and a upgraded People Mover. Even some of the weapons are based on the ones used on the Buzz Lightyear attraction. If you have been on the People Mover ride, you will recognize that the design of Tomorrowland bears some resemblance to the model seen on the iconic attraction that is said to be the inspiration for EPCOT (Experimental Prototype Community of Tomorrow). Taking the existing attractions in the theme park land Tomorrowland and translating them into the diegesis of the movie Tomorrowland was done incredibly well and I feel Walt would be proud of this grand example of the convergence of two entertaining mediums. Even though here are obviously similarities in the plot to other movies that carry along them theme “if humanity doesn’t change, it will mean the utter destruction of the world in acute and violent ways,” there is enough original content and development that it will not feel like another doomsday movie with the ticking-time-bomb plot device. The movie focusses on two characters and then their paths merge with one another. If you were to envision the movie as a road, think of it as two separate roads merging into one. I would even venture to say that there is a little of the 1980s classic The Neverending Story in this modern tale of dreams, destruction, change, and the future. Despite how easy it would have been for the writers to have greatly emphasized the socio-political context of much of the movie, the socio-political themes are mostly subtle and the film doesn’t feel like propaganda (much in the same way Avatar certainly did). When a movie essentially has two protagonists, it can become problematic for the writers and director, because fully executing thorough character development, grows increasingly difficult in the storytelling process (like trying to 100% focus on two things at the same time–it seldom happens). But, both the characters of young and adult Frank Walker (George Clooney) and Casey are handled very well respectively and both have unique character arcs. Although the obvious CGI integration was sometimes a little too much, and I would have preferred practical set designs and special effects, both the “real” and the computer generated facets to the films production design were well-crafted and used effectively in the narrative. Sometimes in movies designed to be best-viewed in IMAX, the studios will play to the screen size, so to speak, even if it’s breaking away from the authenticity and very essence of the movie. No so, with Tomorrowland. The movie uses the IMAX technology as a storytelling tool, not merely a spectacle. Unlike many movies I have seen in the last couple of years, this one has well-defined central characters, with clearly established external goals, well-developed internal goals, and clearly defined opposition to those goals by way of the antagonist Nix (Hugh Laurie) and to a lesser extent, time itself. It has everything a wonderful movie needs to have in order to make the most of an exemplary narrative and excellent entertainment value. If you are looking for a movie to watch this Memorial Day weekend, even though the remake of the horror classic Poltergeist may be tempting, definitely plan to see Disney’s Tomorrowland. You will be delightfully entertained for the entire runtime of the movie. It is highly unlikely that you will become bored in this film. Grab your friends, after your Memorial Day cookout, and head to the theatre. As always, if you enjoyed this review, please SHARE on Facebook or Twitter and I encourage you to FOLLOW/SUBSCRIBE to this blog. Also, a big thank you to all the men and women who serve in the US Armed Forces, as we specifically remember the ones who currently serve or have fallen on this special weekend.